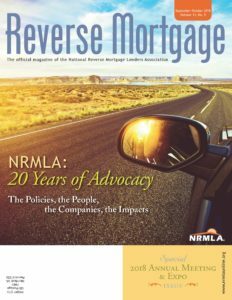 To commemorate the end of the 20th year since NRMLA was organized, the September/October issue of Reverse Mortgage magazine, our Annual Meeting & Expo Issue, takes a comprehensive look back at the history of the organization and the program. In these pages you’ll find highlights (the creation of HMBS and the passage of the Stabilization Act), as well as lowlights (Senator McCaskill’s assault and our own October surprise). You’ll find extensive borrower and potential borrower research, as well as an anecdotal cross country look at impacts on borrower’s lives. You’ll find names of people and companies that were likely once an integral part of your daily conversation but no longer cross your lips or your minds. For those of you who have been here awhile, this dosage of nostalgia might brush you up on reverse mortgage industry trivia and even evoke a sigh of relief that those days are all behind us. To those of you who got on board at a recent stop, this look back can provide a deeper understanding and appreciation of the people who laid the groundwork that has provided you with opportunity.